Your may clear system traces such as registry traces, temp files, system history, and various log files. You may see the contents of any particular item on its respective panel. You may also include system's own traces cleaning into a large wipe and clean task. 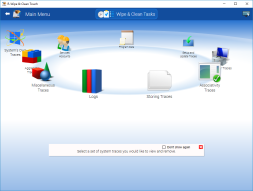 Go to the Setting a Large Wipe and Clean Task section for details. The list of items visible on the System panel can be edited on the Customize panel. • Select the System's Own Traces item. The System panel will appear. • Go to the required section(s) and select the required items. The section may contain some critical items that may affect system performance. R-Wipe & Clean will throw a warning about these items if you select the entire section. Select these items only if you completely understand what you are doing. • Tap the Clean Now button. 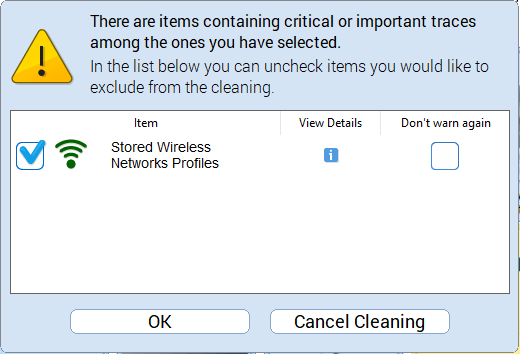 R-Wipe & Clean will start cleaning the computer, and the Deleting and wiping dialog box will appear showing the cleaning progress. You may read more about these items in the R-Wipe & Clean Classic help. This part allows you to inspect and clean various logs created by various system components. Quite often you may gain some free drive space upon removing these logs. A log file of the Windows Component-Based Servicing activity that may help in troubleshooting. Delivery Optimization Service Events Log created by the delivery optimization service for troubleshooting. Deployment Image Service and Management Log Microsoft (DISM) tools can reate a log to assist in tourbleshooting. Your system creates several log files that assist in troubleshootng. Double-click a file to view its. content. Microsoft .Net tools and services may create logs to assist in tourbleshooting. Double-click a file to view its content. Network Setup Service Events Logs created by the network setup service to assist in troubleshooting of network driver installation. Logs of program installation used to check compatibility. Server-initiated Healing Events Logs created by the Windows Update service to assist in troubleshooting. Services may create log files that assist in troubleshooting. The log of events created by Sleep Study tool that identifies sources of battery drain during computer's sleep time. A log containing a list of files that Windows renames during its startup. May help in troubleshooting. Your system can create various tracing logs that may assist in troubleshooting. Log of Windows Diagnostic Infrastructure (WDI) that help to detect, diagnose and solve common problems with a minimum user interactions. Logs of Windows Diagnostic Infrastructure (WDI) that store information about applications launched during system startup to assist in troubleshooting. Your system keeps a log of Windows events (System, Security, and Applications). You may edit the list of items you want to view. Right-click the header and change the list of items to show. Your system keeps a log of the Windows built-in firewall. You need to restart your system to start wiping this log. You will be prompted to restart your system or to delay wiping until the next restart. Windows Management Instrumentation (WMI) and WMI providers create several log files that assist in troubleshooting. Application Experience Service creates an event log of software updates to programs to ensure they run on newly released Windows versions. The AppModel Runtime Events Log stores the events of Universal Windows Platform applications. The AppX Deployment Server Events Log stores the events of AppX Deployment Server during updating Store applications. The AppX Deployment Service Events Log stores the events of AppX Deployment Service during deploying Store applications. The Audio Glitch Detection Log stores events of audio glitches made by Windows Audio Service. The Audio Playback Log stores a list of audio playbacks by the Windows Audio service. The Background Intelligent Transfer Service (BITS) creates a log of background file transfers. The System Core Application system component creates a log of Universal Windows Platform application events. The Device Setup Manager (DSM) service used for detection, download and installation of device-related software creates a log of events during device setup. The DHCP Client service creates a log of events during obtaining and updating IP addresses and DNS records. The Diagnostic Policy Service that helps detecting, troubleshooting, and resolving problems, creates a log of events. The Device Setup Manager (DSM) service used for detection, download and installation of device-related software creates a log of events. The Group Policy Client service used to apply settings configured through the Group Policy component creates a log of events. The log of events occurred in the system or application at the kernel level. The Kernel Shim Engine that provides device and driver shims creates a log of its events. A device shim is a hardware-specific "workaround". A drive shim is a custom routine for chaning the behavior of the driver. The log of errors occurred in "Known Folders" (Documents, Downloads, Pictures, Videos, etc.). The log of events created by Local Session Manager. The event log of Microsoft account. The event log of Network Connection Status Indicator (NCSI), a service detecting Internet connectivity status. The event log of Network Location Awareness (NLA) service creating a Network Profile for every network it connects to. The NTFS disk event log. The event log of Activity Center that monitors the NTFS disk status. The event log of Performance Diagnostics that monitors system problems. The log of device configuration for the Plug and Play (PnP) service enabling a computer to recognize and automatically adapt itself to hardware changes. The event log of the Plug and Play (PnP) service enabling a computer to recognize and automatically adapt itself to hardware changes. The event log of the Program Compatibility Assistant that helps end users run desktop applications designed for earlier Windows versions. The event log of ReadyBoost that makes NAND memory (CompactFlash, SD cards, and USB memory sticks, etc) be used as a write cache between RAM and a hard drive to increase throughout performance. The event log of Windows Resource Exhaustion Detector that notifiers the user of system resource exhaustion (free disk space, free RAM, etc.). The event log of scheduled diagnostics the system performs. The event log of scripted diagnostics performing periodical system maintenance by automatic fixing problems or reporting them through Action Center. The history log of scripted diagnostics performing periodical system maintenance by automatic fixing problems or reporting them through Action Center. The event log of Windows Shell Core. The event log of the client-side SMB events. SMB (Server Message Block) is a protocol for shared access to files and printers in a network. The event log of Windows Store Client application. The event log of Windows Store Licensing model that allows to run any purchased application any device from one account. The maintenance log of Task Scheduler. The event log of TimeZone Synchronization service updating time zone informaiton. The event log of TWinUI (Tablet Windows User Interface) launching UWP (Universal Windows Platform) applications. The event log of UAC (User Account Control) that visualizes files in system folders for security reasons. The event log of User Profile Service that loads and unloads user profiles. The event log of Windows Connection Manager (WCM) service that makes automatic connect/disconnect decisions by looking at Ethernet Wi-Fi, and mobile broadband interfaces. The event log of Windows Hardware Error Architecture (WHEA) that provides a hardware error handling mechanism. The event log of Windows Defender Service that protects the users from malware and other potentially harmful software. The monitoring log of Activity Center that monitors the state of Windows Defender. The event log of Windows Firewall that protects the computer by preventing unauthorized access through the Internet of local network. The event log of Windows Update service that detects, downloads, and installs updates for Windows and other programs. The event log of WLAN AutoConfig service that discovers, connects to, configures, and disconnects from, a wireless local area network (WLAN). The event log of Windows Management Instrumentation (WMI) service that provides a common interface and object model to access management information about operating system, devices, applications, and services. The event log of Windows Push Notification (WNS) service that provides sending push data ("toast" and "tile" updates) to Universal Windows Platform applications. This part allows you to inspect and clean various traces (mostly insignificant) left by some system applications and services, some already removed from your system. Most of these traces are stored in the Registry. Your system can keep various compatibility settings for already removed applications. Your system can keep the environment variables created by already removed applications. Your system stores list of modules that applications share. Your system stores locations of type libraries that store information about COM objects from already removed applications. Your system stores some information about tasks scheduled by already removed applications. Your system stores information about services of already removed applications. Your system stores information about already removed legacy services. Your system can keep some information (like secret key) about wireless networks your computer ever has been connected to. You may select those profiles to remove their data. This part allows you to inspect and clean various traces connected with associativity of file types, protocols, etc., with already removed applications. Your system can keep autoplay information (what Windows is to do when detects a certain media files on a removable media device) for already removed applications. Your system can keep the Class Identifiers of COM objects in already removed applications. Your system can keep the COM interface Identifiers contained in already removed applications. You system can store some information about already removed e-mail applications. Some applications can save info about various events to the Application log of your system. Also, your system can keep some information about those applications, even if they have already been removed. Your system can keep the file name extensions associated with already removed applications. Your system can keep the built-in firewall rules for already removed applications. Your system stores locations of image acquisition applications - programs that start when an image-capturing device like a scanner, digital photo or movie camera. Your system stores information of a proxy image acquisition application - a program that start when an image-capturing device like a scanner, digital photo or movie camera, if no other application is assigned to those actions. Your system can keep some information about Image Acquisition applications, programs to launch when you press the Scan button on a connected scanner. Your system stores MIME types registered by already removed applications. Your system stores some information about news readers already removed from the system. Your system stores names of already removed applications and perceived types associates with them. Your system stores program identifiers from already removed applications. Your system stores information about web browsers already removed from your system. This part allows you to inspect and clean various data left by installers of already removed applications. Most of these traces are stored in the Registry. Sometimes you may significantly clean the Registry by removing these traces. Your system can store information about distribution kits of already removed applications. Windows Installer stores paths used during the installation of some programs or services. You system can store Windows Installer package files (with patches) of already removed applications. Windows Installer stores the Registry key names used during the installation of some programs or services. Your system stores information about already removed applications. This part allows you to inspect and clean various data left by system setups and updates. Log files created when your system has installed its components. Double tap a file to view its content. Your system stores log files created during installing updated (security and other critical updates that protect your computer). WSUS (Windows Software Update Services or Windows Server Update Services) create some temporary and log files that assist in troubleshooting. WSUS (Windows Software Update Services or Windows Server Update Services) creates a log file that assist in troubleshooting. This part allows you to inspect and clean various traces left by system services and installed application and which are common to all users of this computer. Windows Defender can log some details of its activity. Windows Defender can log a brief information about detected viruses. The Network Inspection Service of Windows Defender can log its activity to assist in troubleshooting. Windows Defender creates various logs during disk scan to assist in troubleshooting. Windows Defender stores some details about each disk scan. Windows Defender stores some details about each quick disk scan. Windows Defender can use the Windows software trace pre-processor to trace its operations for troubleshooting. Your system stores a cache of files with the detailed information about files used by Windows to perform very fast search among most frequently used files on the computer. Attention! When deleting and wiping the cache, you do not remove the files, only their cached copies. Your system stores detailed information about files which Windows uses to perform very fast search for most frequently used files on the computer . Your system stores detailed information about files which Windows uses to perform very fast search for most frequently used files on the computer . Double tap a file to view its content. Traces of the Digital Rights Management protecting proprietary data from illegal usage. Double-tap a log to view its content. The activity traces for Reliability Monitor, and advanced tool that estimates hardware and software problems and other computer changes. The activity traces for the Microsoft's Software Quality Monitoring program. Update Orchestrator Events Logs created by the Windows Update service to assist in troubleshooting. Logs of Windows Security Service that handles unified device protection and health information. App Repository is used when downloading and installing applications from the Store. Red items can contain important information. They are not selected by default and can be removed only manually on this panel. A list of links to removed applications stored in the All Programs section of Start Menu. Stored information about removed applications launched during logon. Attention! When cleaning this list, you do not remove the files, only their links . This part allows you to inspect and clean various traces left by 3 predefined system accounts : Local System, Local Service, and Network Service. Temporary files that the "Local Service" account creates. Temporary files that the "Local System's" account creates. Temporary files that the "Network Service" account creates. The Direct3D Shader Caching Library of the System creates a cache of its files. A cache of documents used to authenticate web site certificates. Those include certificates, Certification Revocation Lists (CRL). Cleaning this cache removes cached copies, not the original files. Cached filename extensions of file types registered by applications, some of which may be already deleted. Cached shell extensions (added shortcut menu items added by installed applications) . Attention! When cleaning the cache, the extensions aren't removed, only their cached copies. Your system stores a cache of Windows Presentation Foundation fonts installed in the system. Attention! When deleting and wiping this cache, you do not remove the fonts, only their cached copies. Various logs created by the Common Language Runtime (CLR) component of the .Net Framework. You my view a log file by double-taping it. Logs created by various services and programs running under the "Network Service" account. You may view a log file by double-taping it. Various traces created during peer-to-peer network connections with other computers. A list of application descriptions and their pats for applications that have started in the system at least once. A list of applications assigned to perform some acotions automatically upon detected media files on removable storage. Some information on them may remain even when they have been removed from the system. Events assigned by autoplay applications, which can be already removed. A list of Internet Explorer shortcut menu commands installed by applications already removed from the system. This part allows you to inspect and clean various multiple-part traces. Any part of these traces can be removed separately. Registry records of items used by system (recent system applications, etc.). Empty system registry trace lists are dimmed. A tree of temporary files and logs created by various system services and programs. Catalog Database Service, Key Service, and Protected Root Service create temporary and log files for troubleshooting. Security Management Tools create temporary, database, and log files for troubleshooting. SRU (System Resource Usage) Monitoring Service tracks the use of hardware (CPU, memory, disk, and network) and software (file handlers and modules) resources. This part allows you to inspect and clean various miscellaneous traces. List of temporary files and folders created by your system. Your system stores a cache of fonts installed in the system. List of programs and services that caused problems to Windows. Your system can create a cache of some information about compatibility of applications that run on your system, including those already removed from the system. Areas of hard disks that Windows uses as it were physical memory. Data from any running program or system process may be written to these files. To start wiping swap files, you must restart your system. You will be prompted either to restart your system to start wiping the swap files, or to delay wiping until the next restart. Your system stores this list of files and folders in order to enhance the defragmentation process. Attention! When deleting and wiping the list, you do not remove the files, only the list. Your system creates these files in order to minimize system and application startup and stores them in a cache. If you delete a prefetch file for an application, the system will create it again next time the system starts the application.